MOSCOW (Reuters) - Venezuelan President Nicolas Maduro accused Donald Trump of ordering neighboring Colombia's government to kill him, but said he was open to the possibility of talks with the U.S. leader and his own domestic foes. 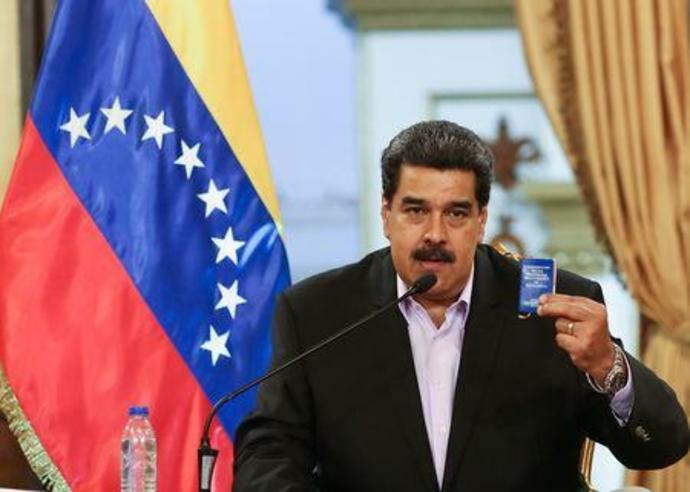 In an interview with Russia's RIA agency, Maduro rejected calls for an early election, said an order to arrest his rival Juan Guaido had not yet been given, and promised Caracas would honor debts to Russia and China. Venezuela plunged further into turmoil last week after the United States recognized Guaido, 35, as acting president, while Russia, which has lent Caracas an estimated $17 billion since 2006, continued to back Maduro. "Donald Trump has without doubt given an order to kill me and has told the government of Colombia and the Colombian mafia to kill me," Maduro told RIA. Though the Venezuelan was reprising an old allegation that critics scoff at as a smokescreen, there was speculation of military plans after Trump adviser John Bolton appeared on Monday with a pad showing the words "5,000 troops to Colombia." "If something happens to me one day, Donald Trump and Colombian President Ivan Duque will bear responsibility," Maduro said of his right-wing foes. Maduro, who survived what he called an assassination attempt in August last year, said he was well protected, guaranteeing him a long life. He declined to comment on reports Russia sent private military contractors to help guard him. He also dismissed calls for a snap presidential vote, saying his re-election last year was fair despite widespread allegations of fraud and the barring of two opposition rivals. "I won 68 percent of the vote," he told RIA. "I won legitimately... If the imperialists want a new election, let them wait until 2025." "I am ready to sit at the negotiation table with the opposition for us to talk for the benefit of Venezuela," Maduro was quoted as saying. Regarding the investigation and possible arrest of Guaido, he said: "As far as I know, this measure has not yet been taken. Let's wait for the internal constitutional and legal processes to see what the results will be. We won't rush, we'll wait."